*lookingcomfoosed* .....aaaaand, what's wrong with that?? Oh, Gosh! Our mom said yes to about all of those items listed above! 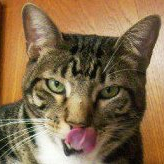 :)) Here\'s another one (she actually said this, too): You say to your friend, \"That was so funny it had me meowing out loud!\"
mom is guilty of almost all charges MOL!!!!! and dern proud of it!! our mom is punk, and planning to do a tattoo tribute to us:D. some of her piercings even have cat charms. and all of us were holiday kitties. me on her birthday & anniversary, spike mother's day, morti xmas, lydia valentine's day:))! :c9 she however feels she's not a "crazy cat lady" she refers to everyone else as "crazy non-cat people" or cat challenged. How about: You wake up in the morning with a sore back because you spent the night sleeping "around" your assorted friends. Momma's guilty of that one.:))! Another one: your cat follows you into the bathroom and sit and watches. Vinnie: Mommy closes the bathroom door now because of that. Mommy also checks on us about 2-3 times just before she leaves the apartment to make sure we're ok.
) Those are Funny!! How about this one? You put off going to the bathroom until you absolutely can not stand it, because your cat is sleeping on your lap/legs. Gee, I thought ours was the only family where everybody goes into the bathroom with Meowmy. Some of us even sit on her lap if it\'s one of those occasions when the toilet trip looks like it\'s going to last for a while.